MOVE IT -‐ putting things in order has never been such fun! MOVE IT! 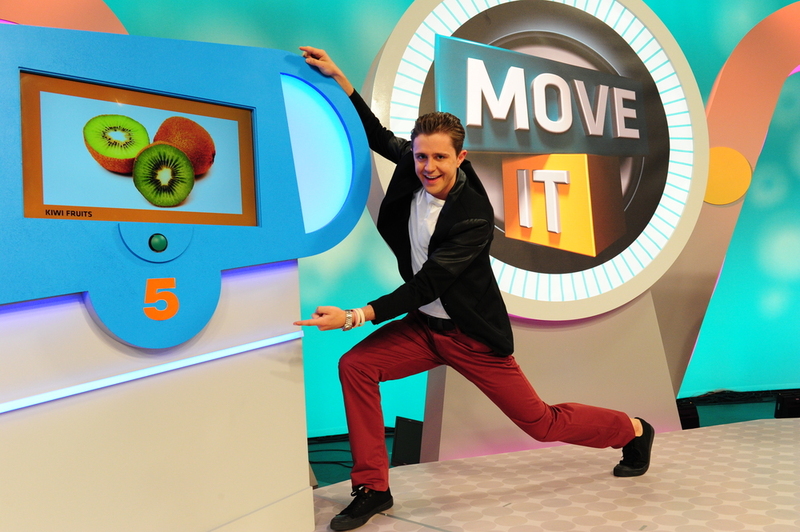 is a fast and fun filled kid’s game show that’s all about putting items into the correct order. And those items could be anything – heaviest animals, largest countries or fastest cars. All the competing teams have to do is study them and...MOVE IT! Over four frantic rounds two teams of two kids will go head-‐to-‐head as they try to order the different categories thrown at them by our animated host. The more they get right the more points they’ll score. And after four rounds the team with the highest score will go on to play for some great prizes in the end game – The Final MOVE IT! Each team has their own Chain – a bank of five monitors that stands behind them. In the Links of the Chain (the monitors) appear images, illustrations or the names of various items. Against the clock, the teams must put the items into what they think are the correct order by running and locking in the answers on the screen. The items in the Chain are revealed in a variety of different ways. Some rounds are simple Move Its, where the items appear in the Chain in one go and the teams simply have to order them. Other rounds see the teams going head-‐to-‐head, buzzing in to answer questions about what items appear in the Chain. Points are scored for correct answers as well as placing them in the correct order once they’ve all been revealed. There’s variety, hecticness and loads of entertainment throughout the whole show! After the four rounds are complete the highest scoring team will go on to play the end game called The Final MOVE IT. Here photos appear in the Chain that the team will be asked questions about. For every answer they get right they get points. The winning team goes through to the final MOVE IT round. If they get the items in the correct order they win a bonus prize.